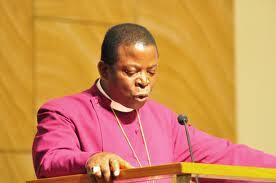 ABUJA—The Primate, Church of Nigeria (Anglican Communion), the Most Revd. Nicholas Okoh, yesterday, called on the Federal Government to pull out of the United Nations Organization, UNO, if it continued in its recognition of gay marriage in the guise of promoting fundamental human rights. The Primate, who made the call in Abuja at the human rights consultative forum to define the stance of the church on the issue of human rights and homosexuality, described as a wolf in sheep clothing those championing homosexuality under the guise of human rights advocacy. His words: “In reaction to the role of the UN human rights groups who were using that platform to fight for the two Malawi boys who got married as homosexuals, I said that if the UNO is now an organ for the advancement of homosexual lifestyle, it was time Nigeria pulled out of that organisation in order to protect the moral health of our nation. “That Malawi palaver raised many questions in my mind and I believe that many of our church leaders and those others involved in mobilisation and advocacy projects may be having the same problem, because many things are happening rightly or wrongly in the name of human rights. It has become absolutely necessary to know more about it. “We live our life here; men marry women, women marry men, for anybody to come in the name of human right and begin to advocate that we live without regard to our moral standard is not a friend. This human right is not culturally conditioned. Doesn’t it have a content? What is acceptable in China, England, USA, does it necessarily become acceptable in Nigeria? The Primate queried. The guest speaker, Dr, Vinay Samuel, from UK in his keynote address, urged Nigerians to be carried away by the quest for human rights that will make them flourish rather than one that was contested, saying every human right must be shaped by the cultural understanding of each area. He said: “Nigeria as a much larger nation has to take leadership in seeking to relate human rights to Christian faith and to African culture. “The church cannot be just defensive in this context. It is a struggle where it must be able to be active in shaping the outcome, not by numbers or moral posturing, but by careful reflection and by proposing substantial alternatives. “The church is under pressure by the state to align its policies and activities to the view of rights set forth in the states policies and laws. This is very likely the way of the future as states develop policies and laws that are shaped by an understanding of rights that are promoted internationally and businesses, civil society institutions and religious bodies in particular will be forced to comply. This entry was posted on Wednesday, June 29th, 2011 at 8:46 pm	and is filed under Uncategorized. You can follow any responses to this entry through the RSS 2.0 feed. You can leave a response, or trackback from your own site.